Bold style blends with capable performance in the form of the 2017 Toyota Avalon. Enjoy the efficiency of its 268-horsepower standard engine that gets a fuel rating of up to 30 mpg on the highway. Or, indulge in any of its many upscale standard features, such as dual-zone automatic climate control, chrome accents on the outside and inside, Entune Audio with integrated navigation, live traffic and weather updates, and more. 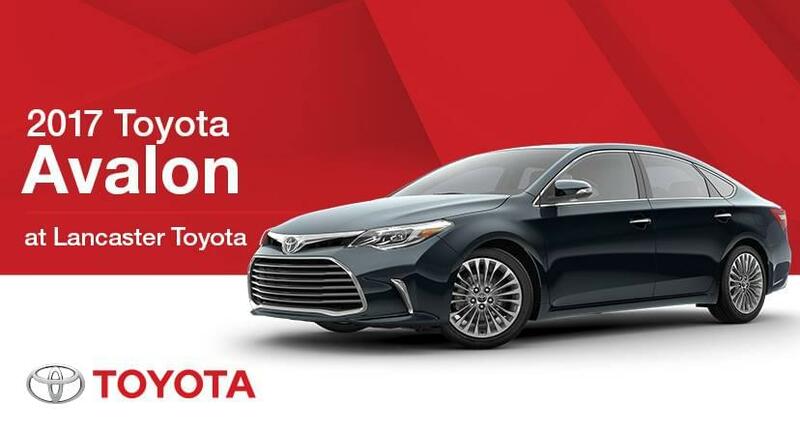 The Toyota Avalon delivers standard luxury and performance like you’ve never seen. The 2017 Toyota Avalon is available in eight trim levels: XLE, XLE Plus, XLE Premium, Touring, Limited, Hybrid XLE Plus, Hybrid XLE Premium, and Hybrid Limited. Need versatility? Just a picky person in general? The 2017 Toyota Avalon comes in eight trim levels and offers a whole host of available features, too, ranging from powertrain upgrades to innovative safety systems, leather and chrome trim. What’s more, the Toyota Avalon comes standard with Toyota’s Star Safety System and Safety Sense P packages of smart security features, so you can feel more secure than ever behind the wheel of the 2017 Toyota Avalon. Test drive one today at Lancaster Toyota in East Petersburg, PA!